There are many ways to buy our pork. 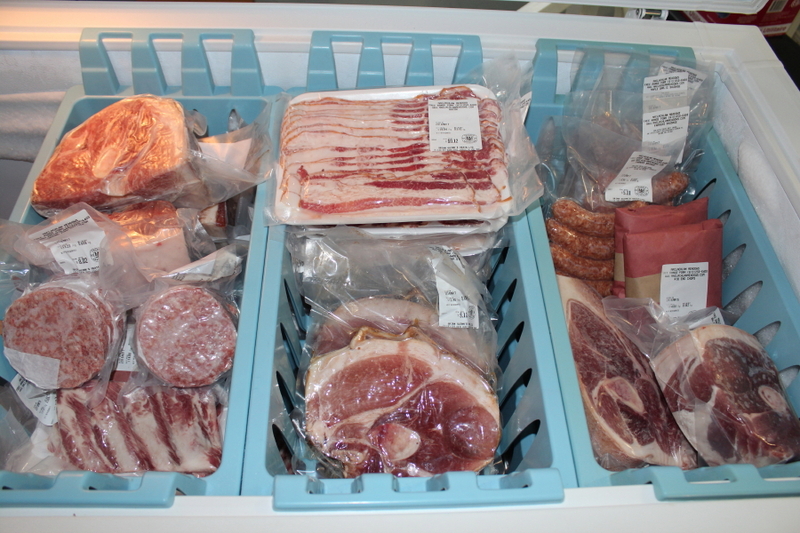 If you have a freezer and want a half or whole, contact us for butchering options, i.e., how large you want roasts and hams to weigh, how many chops per pack, if you want smoking done (bacon or ham) etc. Or, if you would just like to try a pack of pork chops or a roast, that's fine as well. Our goal is to have you try our pork and we're sure you'll be pleased! All of our meat is professionally slaughtered and butchered at a government inspected facility. Everything is weighed and labelled at the butcher. The ham and bacon are brined with brown sugar mixed in the brine, then naturally smoked over maple wood. Hams and roasts are 3 pounds average, chops are two per pack, ¾” thick, bacon is usually around ¾ to 1 pound and ground pork is in 1 pound packs. Pork patties are in packs of four and each patty weighs 5 ounces. Price for a side is 4.75 per pound, based on hanging weight. Smoking is an additional 2.50 per pound. Individual cuts are listed below. We are now taking orders for fall sides. I also have a selection of cuts in the freezer for anyone who wants just a few things. You can place an order and pick it up at the farm gate. I can also deliver within the Kemptville area or further for a small delivery charge. At the present time these are the only cuts I have available. Sausage flavours are Hot Italian, Honey Garlic and Bratwurst. Sausage patties are Farmer.